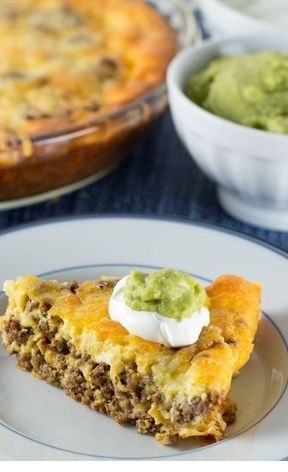 A simple, crustless meat and cheese dish that makes a wonderful main dish supper. In a small bowl, stir together all of the ingredients (chili powder, paprika, salt, black pepper, cumin, garlic powder, onion powder, oregano, and cayenne.) Set aside. Preheat the oven to 350 degrees F and grease a 9-inch glass or ceramic deep dish pie pan. Brown the ground beef in a large skillet over medium heat until no longer pink about 7 minutes, breaking up any clumps with a wooden spoon. Add the taco seasoning and stir until combined. Spread the beef mixture in the greased pie pan.